Dancing to the title? 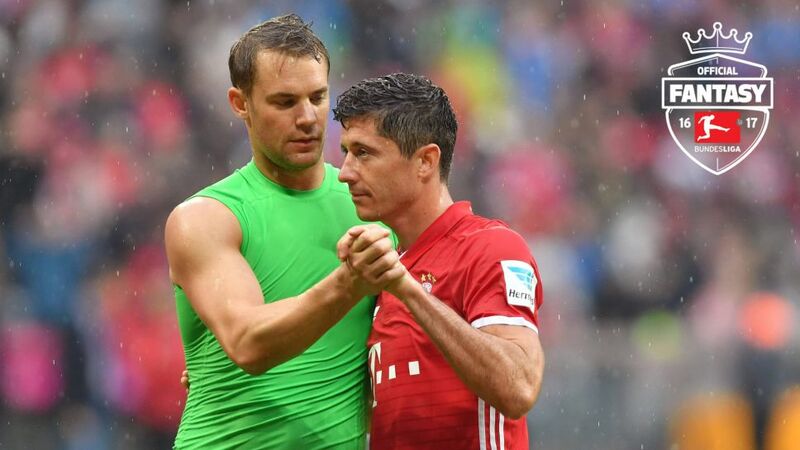 Manuel Neuer (l.) and Robert Lewandowski (r.) are two players who have increased their Official Fantasy Bundesliga value the most. The first five Matchdays have been concluded, and there has been plenty of excitement and drama for members of the Official Fantasy Bundesliga football manager game. We have put together a list of players, who have increased their value the most in the rankings this season. As you may know players in the Official Fantasy Bundesliga manager game do not have fixed in-game transfer values. Indeed the value of every player changes on a weekly basis. Whether a player increases his value, or loses value, depends first and foremost on his average performance in comparison to other players on the same position. For example, the value of a goalkeeper will increase by 100,000 if he has three to five points more than the average of all other Bundesliga keepers. His value will go up by 200,000 if he manages six to nine points more than the average. Finally, should he manage to get more than ten points than the average of all other keepers his value will increase by 250,000. The same principle applies for minus points. But players will also decrease in value if they do not play, or have been dismissed in a match. It is therefore no surprise no that Manuel Neuer has been able to increase his value since the start of the season. After all the FC Bayern München keeper has won all five of his matches, and only conceded one goal. His 43 points means he has the most points of any keeper in the game, and his transfer value has increased from 15 to 15.8 million. >>>Sign up for the Official Bundesliga Fantasy manager game here. There are, however, a few surprises when it comes to players who have been able to increase their value by 0.7 million. Aside from Robert Lewandowski the list includes 1. FC Köln striker Anthony Modeste, his teammate Frederik Sörensen, and finally Konstantinos Stafylidis of FC Augsburg. Stafylidis has not only been a bank defensively, but has also scored two goals for his club.